The student's hydroponics kit is the most sensational hobby kit manufactured by higronics in India under the 'Make in India' initiative. Looking for a return gift for your child's birthday, or a takeaway souvenir from your meetings? 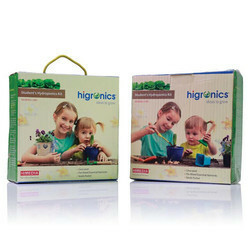 The student's hydroponics kit is an exciting and sophisticated option for you! You can now educate your children at home as they can observe the growth of plants and roots at home without coming in contact with soil or manure. Just open and water DIY (Do it yourself) kit for your children and for the child in you. Now enjoy homegrown veggies from your tabletop! No soil, no dirt, and a bucket load of fun! Looking for Students Hydroponics Kit ?